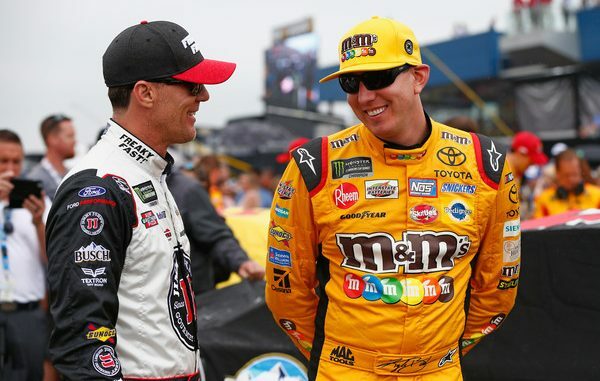 Kyle Busch essentially won ‘Best in Class’ with a fourth-place showing in Sunday’s rain-shortened FireKeepers Casino 400 at Michigan International Speedway – the lone Toyota in a front-running, race-winning group of seven Fords. It was an amazing run for the former Monster Energy NASCAR Cup Series champion, who had to start from the rear of the 39-car field because his No. 18 Joe Gibbs Racing Toyota had a pre-race inspection failure. The run to the front wasn’t a victory for the season’s four-time winner and current championship points leader, but being best in class was acceptable under the circumstances Sunday afternoon in a late-day, rain-interrupted, cool and cloudy afternoon. “Our car through the corners was really awesome,” Busch said on pit road after rain caused NASCAR to determine the race official 133 laps into the scheduled 200-lapper. “Our M&Ms Camry was really good there after yesterday’s practice. I thought we had something for them and if it was going to be a little hotter or sunnier today I thought we were going to be really good. That just wasn’t the case today – chilly, cool and lots of grip and that was better for those guys. Busch’s chief championship challenger this season – five-time race winner Kevin Harvick finished second to his Stewart-Haas Racing teammate Clint Bowyer, who gambled with a quicker two-tire change on the final pit stop while most of the field opted for four. The race was the first “SHR Sweep” for the team with Bowyer’s win, Harvick in second and Busch’s older brother Kurt Busch in third. In fact, the Busch brothers were dueling it out for position in the final laps with older brother Kurt taking a slight edge for third, before the race was called for rain. Both Kurt Busch and Harvick said they weren’t the least bit surprised to see Kyle Busch fighting it out up front, no matter where he started. In fact, Busch wasted no time making his way through the field. He was 20th – by the 22nd lap – having passed literally half the field to get back up and challenge the frontrunners. “It was just a matter of time before you’re going to see them pop up because we had the competition yellow at Lap 25,” Kurt Busch explained. “There’s Stage 1, another yellow, then there’s the two-tire sequence that you can jump in on if you really want to gain some track position. And Busch didn’t disappoint – putting on perhaps the most dramatic efforts of the afternoon driving up from the last row on the starting grid and keeping the Fords honest up front in the closing laps. “If it would have gone green the rest of the way, I felt like we could keep up with them. I felt like our long run speed was better than theirs was. If we could have had some green flag stops and maybe made up some ground on that I felt like we would have been alright. The fourth place was good enough to keep Busch’s lead atop the Cup championship standings. 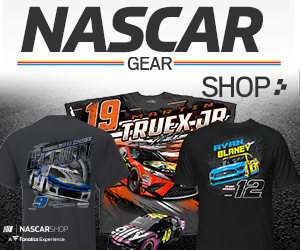 He holds a 75-point advantage over five-time race winner Harvick and a 98-point edge on Joey Logano as the Monster Energy NASCAR Cup Series enters an off-week before the June 24 Toyota/Save Mart 350 on the Sonoma, Calif. road course.